The Back-to-School season is the second largest when it comes to spend, but takes first place when it comes to length, bringing challenges and variables that other seasons don’t need to worry about, such as different trends in product variations, fashion season changes, and unique shopping spikes within each category. Each year, Deloitte conducts a survey of 1,200 consumers to examine the shifts in Back-to-School shopping behaviors. While in past studies, there were dramatic year-over-year shifts in consumer-reported shopping behaviors and attitudes, the 2018 Back-to-School Survey found that several key trends are stabilizing, providing retailers and brands with reliable data they can use to create a holistic view of the BTS shopper and craft integrated shopper marketing strategies with. Classroom needs, such as notebooks and pencils, are often the first products that come to mind when the back to school season starts. According to the study, classroom supplies are estimated to constitute only 22% of the season’s total spend this year though, holding about the same sales percentage as last year. The category that tops this and makes up for $10 billion (55%) of the seasons spend is clothing and accessories, while technology comes in third, with computers & hardware comprising 13% of spend and electronic gadgets holding 8%. The clothing and accessories category jumped 10% from 2016 to 2017 and is anticipated to continue to hold this growth in 2018. In one of our recent posts, “Walgreens’ Back-to-School SM Inspiration,” we discussed how back-to-school shopper solutions are no longer confining their focus to the academic needs of students. Instead, they are expanding the scope to include products that encourage social success. With clothing, shoes and accessories emerging as the dominant sales driver, shopping for social success is clearly a key component of BTS. Shopper marketers should put a greater emphasis on creating total shopper solutions that prepare students for both academic and social readiness, integrating clothing, accessories, footwear and personal care products to help boost students’ internal and external confidence. In 2017, the average in-store spend was $288 per customer, over twice the average amount spent online ($103). This year, in-store spend is anticipated to expand its dominance over online, with $292 expected to be the average in-store spend per customer, versus $115 for online. Though the overall spend has increased across each channel, the use of social media for conducting BTS shopping has dropped in the last year from 27% to 23%. This drop in consumer social media usage shows that the initial hype of the channel is diminishing, requiring shopper marketers to closely observe how each category sells across channels and adapt their tactics accordingly. More than 50% of clothes, supplies and electronic gadgets are predicted to be bought in-store this year, while online is expected to take about 20% of those sales, and the remaining percentage of channel sales remains unknown. Consumers are finding more comfortability in ordering things online, but in-store remains the clear channel of choice. As consumers reach a point of digital saturation, some brands and retailers are focusing less on improving their online presence for the season and more on integrating mobile into their in-store shopping experience as a way of leveraging the popularity of in-store with the interactivity of digital. Brands that wish to utilize social for the remaining 30% of open channel sales should look to develop ways to deliver more relevant ads for the categories that consumers are must likely to buy online. They must go past pure discount ads and fully integrate their social promotion with their regional in-store strategies. This year’s Deloitte study revealed that 62% of BTS shoppers plan to start their shopping before August and the majority of spending will occur in the four week period between mid-July and mid-August. 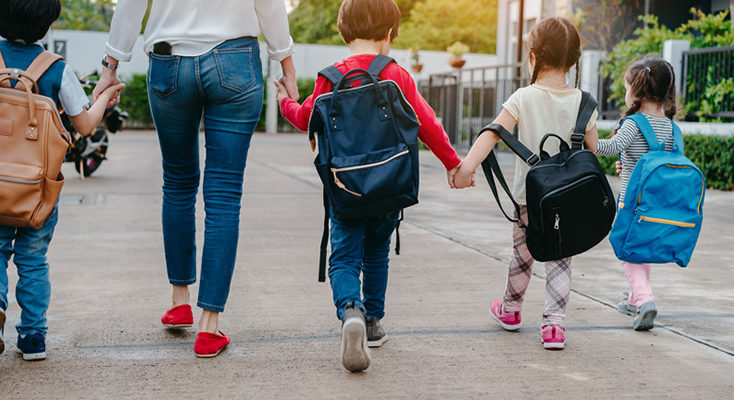 This is in sharp contrast with 2007 shopping behaviors, where nearly a third of households didn’t begin their BTS shopping until a week or two before the school year began. Events like Prime Day and Black Friday in July could be behind the push for early shopping. Parents no longer want to scramble last minute to get all their children’s needs and the Prime program allows for them to get products of all categories on a discount without dealing with the rush of other BTS shoppers. But while almost half of shoppers are starting earlier to receive the best deals, spend averages reveal that these consumers aren’t being as deal-savvy as they think. The average spend of those shopping before August this season is predicted to be $544, almost $100 more than the shoppers who wait until August begins. The extra savings of the late shoppers could be explained by the heightened sales that are found later in the season, but there are many other complex variables that seem to be at hand. Each category in the BTS has different schedules of when new releases come out and when sales are at their peak. BTS fashion trends and fall fashion lines don’t begin to be released until mid-August, while electronic sales spike in July to clear the shelves for new releases coming out in September. School supplies sales peak throughout August, which is great timing for those parents getting the requirements lists needed to complete their supply spending. 60% of the purchases within the supply category are dependent on school requirements, so it can be close to impossible to buy all supply needs without them. The issues with these lists is that there is little consistency in how they are made, or when they’re released. It all depends on each district, school, or even the individual teacher. The late release of supply lists and fall clothing lines prevents early shoppers from purchasing 75% of their shopping needs. This means early shoppers are spending money on items they think they might need, only to have to return and spend more. With all of these different variables, it’s important to try and gain deeper insight into these combined patterns in order to build smarter and more efficient programs. The data within these trends needs to be looked at as ingredients of a bigger opportunity, rather than separate information, so that product categories find their strong points among the different time tables and channels. Once companies do this, the shopping season can see success in ways it hasn’t before – pushing towards better shopping experiences, better insight, and an even better incremental sales lift.